is a name used in Judaism for the Hebrew Bible, also known as the Masoretic Text or the Miqra. The name "Tanakh" is a Hebrew acronym formed from the initial Hebrew letters of the Masoretic Text's three traditional subdivisions: The Torah ("Teaching", also known as the Five Books of Moses), Nevi'im ("Prophets") and Ketuvim ("Writings")—hence TaNaKh. The name "Miqra" is an ancient Hebrew word for the Tanakh, meaning "that which is read", coming from the word kara "קרא" which means to read aloud. The elements of the Tanakh are incorporated in various forms in Christian Bibles, in which, with some variations, it is called the "Old Testament". The Old Testament does not use the traditional Hebrew subdivisions, though the distinction "Law and the Prophets" is used several times in the New Testament. According to the Talmud, much of the contents of the Tanakh were compiled by the "Men of the Great Assembly" by 450 BCE, and have since remained unchanged. Modern scholars are less certain, but some believe that the process of canonization of the Tanakh became finalized between 200 BCE and 200 CE, see Development of the Jewish canon for details. The Hebrew text was originally an abjad: consonants written with some applied vowel letters ("matres lectionis"). During the early Middle Ages scholars known as the Masoretes created a single formalized system of vocalization. This was chiefly done by the Family Ben Asher, in the Tiberius school, based on the oral tradition for reading the Tanakh. It also included some of Ben Naftali and Babylonian innovations. Despite the comparatively late process of codification, some traditional sources and some Orthodox Jews believe the pronunciation and cantillation derive from the revelation at Sinai, since it is impossible to read the original text without pronunciations and cantillation pauses. The combination of a text (מקרא "mikra"), pronunciation (ניקוד "niqqud") and cantillation (טעמים "te`amim") enable the reader to understand both the simple meaning, as well as the nuances in sentence flow of the text. The Tanakh is also called Mikra (מקרא, meaning "reading" or "that which is read"). The three-part division reflected in the acronym "Tanakh" is well attested to in documents from the Second Temple period and in Rabbinic literature. During that period, however, "Tanakh" was not used as a word or term. Instead, the proper title was Mikra, because the biblical texts were read publicly. "Mikra" is thus analogous to the Latin term Scriptus, meaning "that which is written" (as in "Scripture" or "The Holy Scriptures"). Mikra continues to be used in Hebrew to this day alongside Tanakh to refer to the Hebrew scriptures. In modern spoken Hebrew both are used interchangeably. According to the Talmud (Bava Basra 14b-15a, Rashi to Megillah 3a, 14a), much of the contents of the Tanakh were compiled by the Men of the Great Assembly a task completed in 450 BCE, and have remained unchanged since that date. Evidence suggests that the "process of canonization" occurred between 200 BCE and 200 CE. A popular position is that the Torah was canonized circa 400 BCE, the Prophets circa 200 BCE, and the Writings circa 100 CE perhaps at a hypothetical Council of Jamnia — this position, however, is increasingly criticised by modern scholars. Some scholars argue that the Jewish canon was fixed by the Hasmonean dynasty (140-37 BCE). Today, there is no scholarly consensus as to when the Jewish canon was set. Formal closure of the canon has often been ascribed to Rabbinic Judaism after the destruction of the Second Temple in 70 CE. Heinrich Graetz proposed in 1871 that it was concluded at a Council of Jamnia (or Yavne in Hebrew), some time in the period 70–90 CE. However, Rabbinical writings seem to indicate that certain books were disputed as accepted canon (such as Ecclesiastes, Song of Songs and Esther, see also Antilegomena), it may not necessarily be the case. The implication of the Talmud indicates that the books themselves were already accepted canon, but may have been misunderstood on philosophical or ecclesiastical grounds. The Talmud eliminates this misunderstanding. The twenty-four books are also mentioned in the Midrash Koheleth 12:12.A slightly different accounting can be found in the book Against Apion, by the 1st-century Jewish historian Josephus, who describes 22 sacred books. Some scholars have suggested that he considered Ruth part of Judges, and Lamentations part of Jeremiah; as the Christian translator Jerome recorded in the 4th century CE. Other scholars suggest that at the time Josephus wrote, such books as Esther and Ecclesiastes were not yet considered canonical. The Tanakh is an acronym of the initial Hebrew letters of the Tanakh's three traditional subdivisions: Torah, Nevi'im and Ketuvim. According to Jewish tradition, the Tanakh consists of twenty-four books. The Tanakh counts as one book what are sometimes counted as two in Christian Bibles (e.g. 1 and 2 Samuel, 1 and 2 Kings and so forth), and counts Trei Asar (תרי עשר, the Twelve Prophets; though literally, "twelve") as a single book. Torah (תורה, literally "teaching") consists of five books, commonly referred to as the "Five Books of Moses." 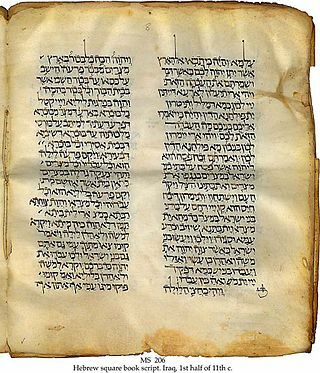 Printed versions of the Torah are often called Chamishei Chumshei Torah (חמישי חומשי תורה, literally the "five fifths of the Torah"), and informally "a Chumash." Nevi'im (נביאים, "Prophets") consists of eight books. This division includes the books which, as a whole, cover the chronological era from the entrance of the Israelites into the Land until the Babylonian captivity of Judah (the "period of prophecy"). However, they exclude Chronicles, which covers the same period. The Nevi'im are often divided into the Earlier Prophets (נביאים ראשונים), which are generally historical in nature, and the Later Prophets (נביאים אחרונים), which contain more exhortational prophecies. Ketuvim (כתובים, "Writings") or "scriptures", are sometimes also known by the Greek title "Hagiographa" and consists of 11 books. These encompass all the remaining books, and include the Five Scrolls. They are sometimes also divided into such categories as Sifrei Emet (ספרי אמת, literally "Books of Truth") of Psalms, Proverbs and Job (the Hebrew names of these three books form the Hebrew word for "truth" as an acrostic, and all three books have unique cantillation marks), the "wisdom books" of Job, Ecclesiastes, and Proverbs, the "poetry books" of Psalms, Lamentations and Song of Solomon, and the "historical books" of Ezra-Nehemiah and Chronicles. In the Jewish version, Ketuvim consists of 11 books, counting Ezra and Nehemiah as one book and I and II Chronicles as a single book. The chapter divisions often reflect Christian exegesis of the Bible. Even when they do not imply Christian exegesis, the chapters often divide the biblical text at numerous points that may be deemed inappropriate for literary or other reasons. Nevertheless, because they proved useful for citations, they are often included in most Hebrew editions of the biblical books. For more information on the origin of these divisions, see chapters and verses of the Bible. Jews don't necessarily reference the specific verse in a chapter (older editions of the Talmud cite only chapter numbers), and some works cite the sectional divisions in the Torah. The chapter and verse numbers were often indicated very prominently in older editions, to the extent that they overshadowed the traditional Jewish masoretic divisions. However, in many Jewish editions of the Tanakh published over the past forty years, there has been a major trend towards minimizing the impact and prominence of the chapter and verse numbers on the printed page. Most editions accomplish this by removing them from the text itself and relegating them to the margins of the page. The main text in these editions is unbroken and uninterrupted at the beginning of chapters (which are noted only in the margin). The lack of chapter breaks within the text in these editions also serves to reinforce the visual impact created by the spaces and "paragraph" breaks on the page, which indicate the traditional Jewish parashah divisions. Some versions have even introduced a new chapter system . These modern Jewish editions present Samuel, Kings, and Chronicles (as well as Ezra) as single books in their title pages, and make no indication inside the main text of their division into two parts (though it is noted in the upper and side margins). In such editions, the second books of Samuel, Kings and Chronicles follow the respective first books on the very same page, with no special break at all in the flow of the text. In the case of Kings, in which no parashah division appears at this point, the text of II Kings continues that of I Kings on the very same line of text. Jewish (Hebrew) editions have a different pattern regarding Chronicles (I Chronicles) chapters 5 and 6. In I Chronicles (in Christian sources) chapter 5 ends at verse 41. Chronicles (Jewish editions of Chronicles) 5:27-41 is equivalent to First Chronicles 6: 1-15 in most English translations. In Jewish (Hebrew) editions 6:1 is equivalent to 6:16 and therefore the chapter ends at Chronicles 6:66 instead of the First Chronicles 6:81 (English translations) and at 7:1 both Hebrew and English versions set off from the same starting point once more. This difference offsets other more contextual differences. The Jewish Tanakh is based on an accepted traditional understanding of the text . For example, Christians translate the word almah (עלמה)as "virgin," while the translation in the Tanakh is "young maiden". This Christian view is based on a different understanding of the Septuagint translation, which according to New Testament Scholars, can mean "a marriageable maiden" or "virgin." The first ever printed Hebrew Chumash simply had Biblical text with Rashi on the page, and since then many editions have appeared. The first Masoretic Mikraot Gedolot was printed in 1524-1525 in Venice , edited by Daniel Bomberg. The Soncino edition was printed in 1527 in Venice . Many editions of Mikraot Gedolot have been made since then. Rudolf Kittel's Biblia Hebraica appeared in 1906 and was reprinted in 1913. The Leningrad Codex was edited under Paul E. Kahle as the Biblia Hebraica (BHK), published in Stuttgart, in 1937. The codex was also used for Biblia Hebraica Stuttgartensia (BHS) in 1977, and will be used for Biblia Hebraica Quinta (BHQ). The Leningrad Codex lists a different order for the books of the Ketuvim. Aharon Dotan's edition, which was reprinted with a concise commentary and distributed to soldiers in mass quantities as the official Tanakh of the Israel Defense Forces throughout the 1990s. This has recently been updated as the Codex Leningradensis. The Koren Tanakh (Bible) was the first edition in nearly 500 years to be designed, edited, printed, and bound by Jews. It was published by Koren Publishers Jerusalem, under the direction of renowned typographer Eliyahu Koren, using his specially-designed Koren Bible Type, (Jerusalem, 1962). The Aleppo Codex was edited by Mordechai Breuer in 1977-1982, the first edition to include a reconstruction of the letters, vowels, and cantillation marks in the missing parts of the Aleppo Codex, in 1996-8 re-edited with inclusion of new information on the parashah divisions. Jerusalem Crown: The Bible of the Hebrew University of Jerusalem, 2000. Edited according to the method of Mordechai Breuer under the supervision of Yosef Ofer, with additional proofreading and refinements since the Horev edition. Jerusalem Simanim Institute, Feldheim Publishers, 2004 (published in one-volume and three-volume editions). Hebrew University Bible Project (so far on Isaiah, Jeremiah, Ezekiel) includes four apparatuses, as well as the masoretic notes of the Aleppo Codex. Mikraot Gedolot Haketer, Bar-Ilan University (1992-present). A multi-volume critical edition of the Mikraot Gedolot, ten volumes published to date including Genesis (2 vols. ), Exodus (one of a two vols so far), Joshua & Judges (1 vol. ), Samuel, Kings, Isaiah, Ezekiel, Psalms (2 vols.). Includes the masoretic notes of the Aleppo Codex and a new commentary on them. Differs from the Breuer reconstruction and presentation for some masoretic details. There are two major approaches towards study of, and commentary on, the Tanakh. In the Jewish community, the classical approach is religious study of the Bible, where it is assumed that the Bible has a divine origin. Another approach is to study the Bible as a human creation; in this approach, Biblical studies can be considered as a sub-field of religious studies. Secular practitioners of Biblical Studies do not necessarily have a faith commitment to the texts they study. In fact, Biblical criticism seems to contradict commitment to the idea that the Bible was written by prophets inspired by God. Indeed, this practice, when applied to the Torah, is generally considered heresy by the entire Orthodox Jewish community. As such, much modern day Bible commentary written by non-Orthodox authors is considered trief (forbidden) by rabbis teaching in Orthodox yeshivas. The article on Jewish commentaries on the Bible discusses Jewish Tanakh commentaries from the Targums to classical rabbinic literature, the midrash literature, the classical medieval commentators, and modern day commentaries. Books of the Bible for a side-by-side comparison of Jewish, Catholic, Orthodox and Protestant canons. Philip R. Davies in The Canon Debate, page 50: "With many other scholars, I conclude that the fixing of a canonical list was almost certainly the achievement of the Hasmonean dynasty." Thayer and Smith. "Greek Lexicon entry for Parthenos". "The KJV New Testament Greek Lexicon"
Mechon Mamre - The Hebrew text of the Tanakh based on the Aleppo codex and other Tiberian manuscripts close to it, edited according to the system of Rabbi Mordechai Breuer. Hebrew text comes in four convenient versions (including one with cantillation marks) and may be downloaded. The JPS 1917 English translation is included as well (including a parallel translation). Tanach on Demand - Custom PDF versions of any section of the Bible in Hebrew. A Guide to Reading Nevi'im and Ketuvim - Detailed Hebrew outlines of the biblical books based on the natural flow of the text (rather than the chapter divisions). The outlines include a daily study-cycle, and the explanatory material is in English.